SNAFU! : US Army puts as its objective weapon on the Next Gen Combat Vehicle as a 50mm Cannon with 3rd generation FLIR!!! US Army puts as its objective weapon on the Next Gen Combat Vehicle as a 50mm Cannon with 3rd generation FLIR!!! The Army issued a request for proposals to competitively build next-generation combat vehicle prototypes March 29. The RFP opens up competition for industry to provide Optionally Manned Fighting Vehicle prototype designs. From that pool, the Army will choose — in the second quarter of fiscal year 2020 — up to two teams to build 14 prototypes. Some of the threshold requirements for OMFV are a 30mm cannon and a second generation Forward-Looking Infrared (FLIR) system. Objective requirements are a 50mm cannon and a third-generation FLIR. The NGCV CFT is part of a new four-star command, Army Futures Command, that is designed to modernize the force. NGCV is the second highest modernization priority for the Army just behind Long-Range Precision Fires (LRPF). The Army’s current approach to enter into a rapid prototyping effort truncates what could be a two or three year technology maturation and risk reduction phase, Maj. Gen. Brian Cummings, the program executive officer for Ground Combat Systems, noted in the statement. The Army’s acquisition chief Dr. Bruce Jette approved a rapid prototyping approach for the OMFV in September 2018, which requires a prototype to be demonstrated in an operational environment within five years, according to the statement. Several companies have come forward either with clear plans of what they would like to offer or have declared they will participate in the competition. German company Rheinmetall announced last fall that it would team up with Raytheon to provide its new Lynx combat vehicle. It’s also possible its Puma vehicle, which is co-manufactured with German defense firm KMW, could be submitted. 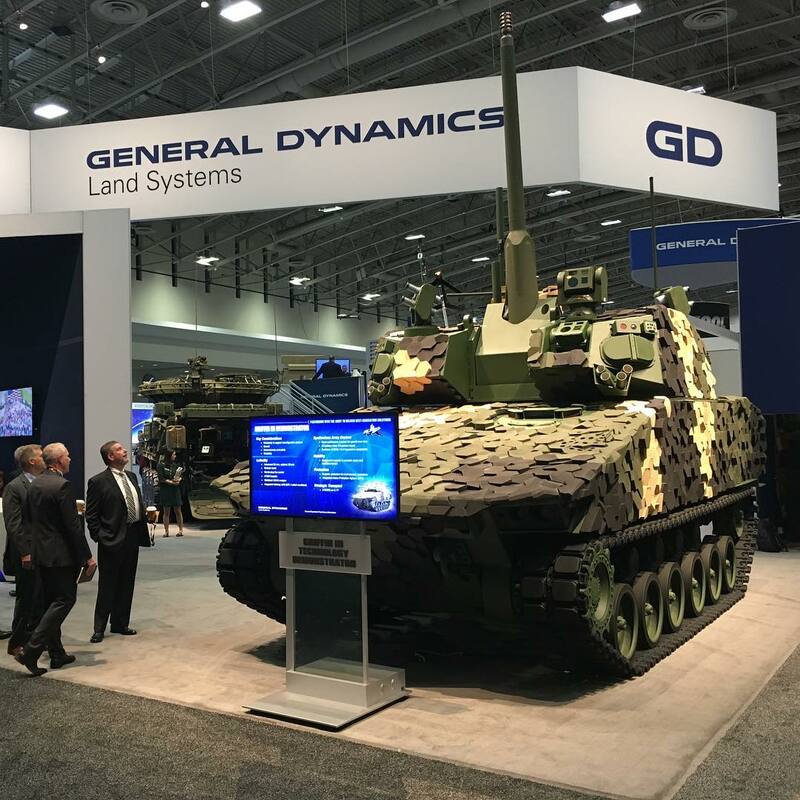 BAE Systems showed what it could do with a CV90 vehicle at the Association of the U.S. Army’s annual show in the fall and General Dynamics European Land Systems turned heads at AUSA with a Griffin III technology demonstrator equipped with a 50mm cannon. WOW! The US Army just revealed its hand and set a new marker for the Free World. 50mm is the new standard. I hope HQMC is paying attention. On a side note. It just dawned on me. The future battlefield is gonna be an INCREDIBLY dangerous place to be. The lethality improvements started by Mattis (yeah I'll give him credit) is pushing at least the Army to get serious about things. Where once 30mm were considered the optimum size for Infantry Fighting Vehicles its suddenly doubled in size. Do you realize how heavy IFVs will now have to get to be able to shrug off this type of fire? We're talking about tank type armor now. Not Leopard MBT armor but Abrams MBT and Challenger MBT type armor! God have mercy on the soul of any Soldier or Marine that's hit with this type caliber in the back of an armored vehicle. For every move there is a countermove. Threat nations will be forced to match this. HELL THE USMC would be smart to match it! Mech Infantry will become much more formidable. Add in the third generation FLIR the US Army is asking for and Javelin anti-tank missiles WILL HAVE TO INCREASE RANGE just to be viable (assuming threat nations follow suit). I've been stating that the armored vehicle revolution was here. I just didn't fully understand the ramifications of it when it kicked off. A peer/near peer battlefield will have casualties like we haven't seen since WW2. How will we sustain forces that are either smashing the enemy, gettin smashed or involved in indecisive fighting?